Hello! I’m really excited to share today’s review because I think it’s a very interesting and unique piece of gear that surprised me over and over again. I tried to keep this one pretty short because I’m hoping most of you will read it. Please take some time to check this one out! Libor Hadrava is an absolute monster. With an unbelievable command of odd meters, four way independence and globally inspired grooves, the Czech-born super drummer is one of the true hidden gems of the drumming community. Beyond that, he owns and operates the celebrated Axiom Music School, and acts as one of the principle builders at Grover Pro Percussion and SilverFox Drumsticks. Busy dude. With all of that in mind, I wasn’t so surprised to learn that Libor had developed a product of his own. 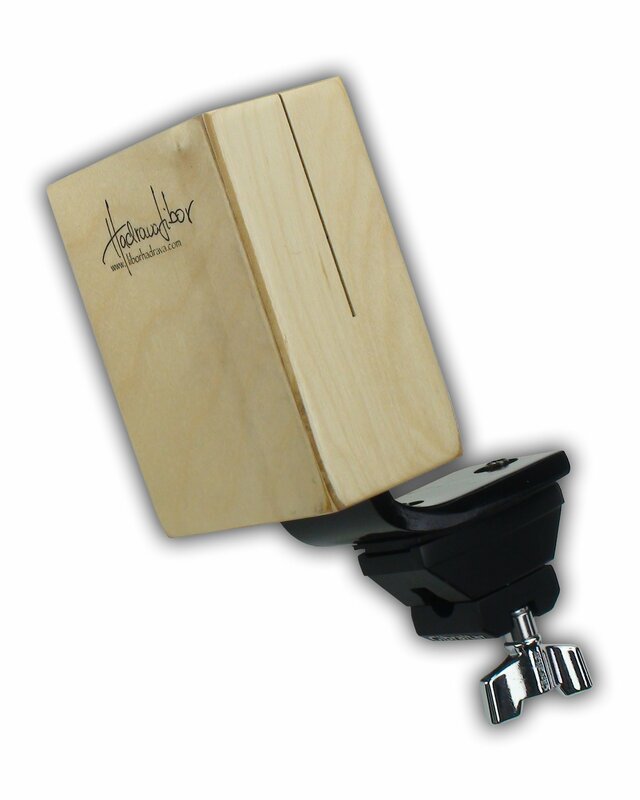 Inspired by the need for a great sounding, bracket-mounted block that could hold up to bass drum pedal play, Libor set to work engineering what eventually became the Lam-Block (Laminated Wood Block). Cut from hand-selected, laminated Baltic Birch, the Lam Block is affixed to a heavy duty bracket with two separate tensioning bolts for added stability. The block mounts to any standard L-arm, and holds securely even under the heaviest play. Because the Lam-Block fits on even larger L-arms, it can also be played with sticks or mallets. With a rich, warm knock that splits the difference between a traditional wood block and a cowbell, the Lam Block really finds a unique sonic space, making it an excellent addition to the kit for anyone on the hunt for something a little different. Struck with a beater, stick or mallet, the Lam-Block is more than capable of handling everything from low to ultra-high volume settings without sacrificing tone or clarity. I brought the Lam-Block to a couple of rehearsals and never had any trouble finding a place for it. I was mostly using it with sticks, and actually, after a few weeks with it, I found myself preferring the tone to my regular cowbell. Under a felt-topped mallet, the Lam-Block produced a deep, warm tone that added a new dimension to my (poorly imitated) Latin grooves. It carried a low, sweet note that didn’t have any of the piercing irritation of many conventional wood and jam blocks. With a medium-weight drumstick, the Lam-block really came to life, offering a dynamic playability that had me working out some very exciting melodies. Played with the tip of the stick, the block had a crisp click with just a little woody tone to back it up. But, playing it with the shank brought out a deep, organic knock, making it perfect for traditional New Orleans-style ostinatos. Finally, because the block has a wide-mouthed open end, I was also able to pull off a few rapid fire stickings by playing with the stick inside the block. After a very, very lengthy evaluation (sorry Libor), I feel like the Lam-Block is a much more multi-faceted instrument than I would have assumed at first look. Whether played with feet or hands, the block offers a bevy of options for players in search of an instrument that can fill several roles at once. If any of you are looking for a unique and affordable addition to your kit that doesn’t feel like something you’ve played before, I would thoroughly suggest the Lam-Block. My advice–practice, practice, practice. That’s how you get to Carnegie Hall.